Millions of farmers across the country have over the recent weeks cursed the relentless heavy rains that hampered harvesting especially of legumes, coffee and destroyed roads. The agony was made worse perhaps by last Sunday’s November 19 heavy downpour that forced rivers like Mayanja, ….to burst their banks leaving behind a trail of suffering and misery. But as the floods recede and the wet conditions are replaced by the usually drier conditions characteristic of December and January, the same farmers who decried the inundation will be yearning for rain, only weeks after the floods. 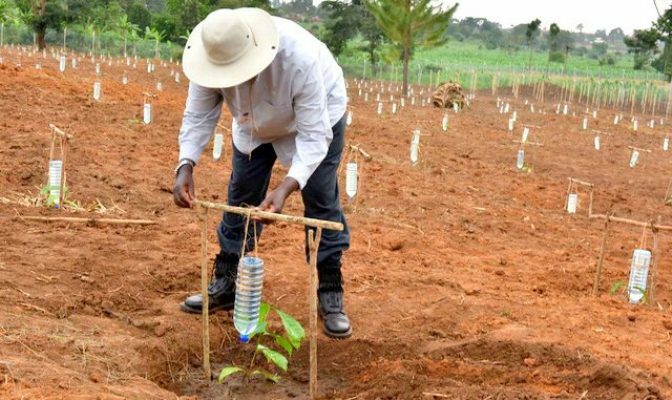 The country’s inability to tap/trap, store and make water available for farmers, on whose efforts the economy largely thrives, has been described as the enduring symbol of the tragedy of poverty that has characterised generations of Ugandans. For some agricultural experts, the country’s lack of focus on utilising water for economic benefit is what makes people fail to realise the opportunities from flood water as a resource to trigger increased agricultural production. The situation was summed up by one agricultural expert as a total failure of the strategy on water for production in Uganda. Prof. Moses Tenywa, from the College of Agriculture and Environmental Sciences of Makerere University, says that although there appears to be some sense of commitment to addressing the challenge of lack of access to water for production, the lack of a holistic approach that addresses both the supply and demand side constraints for water for production. Now however, Ugandan farmers, with support from local and international civil society organisations, want to bring an end to the abject lack of water on their farms, as a major step towards rising from poverty. Farmers leaders meeting under their umbrella organisation – The Uganda Farmers Common Voice Platform (UFCVP) made it clear that the current situation is untenable given the rising challenges of climate change, rapid population growth. UFCVP members, with support from Caritas Denmark, have risen up and want changes in government strategy and resource allocation aimed at increasing access to water for production especially for majority smallholder farmers in the country. The farmers presented their demands to Members of Parliament, Technocrats from ministries of water and agriculture during the Water for Production National Dialogue that was held at Pope Paul Hotel in Ndeeba, Kampala last week. The farmers demands were backed by a scientific study on the status of Water for Agricultural Production in Uganda, which was conducted by Prof. Tenywa. The study’s main findings indicate that the country lacks a holistic strategy on the sustainable access and delivery of water for production in Uganda. “What we are looking at is a complete failure of a strategy on water for production. Given that there is no clear policy on water for production, it means that there is no strategy and even the approaches are different. According to Prof. Tenywa, the mandate of providing access to water for agricultural production lies with the ministry of water. However, he notes, this mandate restricts the ministry to medium and large-scale farmers with over 5 acres of land, hence leaving out majority of farmers at the mercy of weather vagaries. Besides lack of access, Prof. Tenywa observes that there is a challenge arising from the lack of demand for water, arising from uncertain markets for agricultural produce.”Some private individuals would like to invest in irrigation, but without some guaranteed market for their produce, such investments would be risky,” says Prof. Tenywa. The farmers presented a list of demands to government as the solution to the water for production conundrum. Asking government and other partners to invest in increasing water for production especially targeting affordable technologies such as solar-driven irrigation systems. Building capacity of communities to harvest water for production, but also in the planning and maintenance of water for production infrastructure, as opposed to relying on experts. Harmonising the strategy and policies as well as clearly defining the roles of different players in the water for production docket. Relatedly, the farmers want government to establish a special irrigation directorate and a master plan for coordinating all water for production activities in the country. A concerted and monitored plan for tree-planting across the country. Ensuring that Parliament allocates more resources towards water for production. Enhancing access to credit for water for production equipment and products, by removing the prohibitive barriers on access to credit that is generally experienced by farmers.